First off, I wanted to wish everyone a happy new year. Remember that transit runs late and is free tonight, so there is no reason to drink and drive. Also, following up to my post yesterday, the 502 was on-time today with a new bus driver that didn’t stop at Starbucks. Go Translink for fixing this, and only in one day. Let’s hope this lasts. Anyway, I was thinking of the real solution to early/late buses problem. If the bus runs 15min or better and you miss a bus for whatever reason, you know the next one will arrive in a snap. My portion of the 502 only runs every 30min during peak period only. Imagine what it would be like to have an early bus like on some of the routes in Maple Ridge that only come every 2 hours. Ekk. A hat tip to the Peak Energy Blog for helping me to find this gem of arrogance. Someone told me about this advertisement in Vancouver back in 2003, but I could never trace the original down as it was advertising. A Vancouver GM dealer arrogantly advertised that our transit system serves "creeps and weirdos". Interurban trains across North America were replaced by sleek GM cars and buses. It was considered progress at the time, and even our very own BC Electric Chilliwack to Vancouver Interurban (that ran PROFITABLY from the early 1900's to the 1950's) was also replaced in the name of progress. I fail to understand why people love automobiles so much. My vehicle is a utility (like a tool in my garage) and it is no more than that. If there was reliable and convenient transit I would park my vehicle as I did when I lived in Vancouver. My 2001 Honda Accord had only 6,000 km. on it when I sold it to a friend in 2005. What is this love affair all about? Why must half of The Province newspaper contain car advertising and all of these domestic firms are going broke? The Big 3 are always fighting for market freedom and reduced government emission and other standards. But suddenly government is a big piggy bank and is needed. None of these companies shed any tears for the loss of great transportation systems like our interurban and now we have come full circle. The days of the one person per car ARE NUMBERED and we should be bombarding Ottawa and our local municipalities to get LIGHT RAIL INFRASTRUCTURE on the list of priorities for our cities. If we don't do it now during this time of massive infrastructure upgrading, then we will never see our transit needs met any time soon. Forget bailing out the Big 3 and let market forces take their course. Survival of the fittest. It's time to revive Light Rail Transit. Along these lines I found this really neat account of Tacoma Washington's history and mention of their Interurban and the current Sounder trains. The author talks about looking to the past to find what the future may hold for us. He seems like a very wise man. "In celebrating 125 years over the past 12 months, The News Tribune has shown, among other things, that the past is sometimes a harbinger of what will be. In 1898, city commuters rode 17 private streetcar lines – and now there is talk of streetcars once again. In 1902, the first Interurban train traveled from Tacoma to Seattle. Closed in 1930, 70 years would pass until a train called Sounder would once again deliver riders between the two cities." Good morning, so my bus came on time today which was a great thing. Following up from yesterday's post about my bus not showing up. I spoke with my friend that takes the same bus from Langley Centre (I get on at 53rd and 204th). Apparently he was just really early. Two of us at the bus stop had to walk up to Langley Centre yesterday. Anyway, my friend told me that he was "driving like a bat out of hell" to the Starbucks at Fraser Highway and 201A Street. My driver pulled over to the same Starbucks today, but he wasn’t early. I have no problem with drivers getting coffee. With the stuff they have to deal with daily, they should all get free coffee cards. But it shouldn’t be at the expense of picking up riders. Managers often talk about an open door policy with their workers. This is the sign of a good boss, as he or she will be available to listen and talk with employees as needed. But an open door policy doesn't work well on a SkyTrain system! During this past storm, regional transit did not get very high marks for reliability and operations. But a transit user used his cell phone to record this open door operation of the SkyTrain between two Expo Line stations, and then advised TransLink of the problem. The Vancouver Sun recorded the incident here. Apparently the train was being operated by a person at the time and the door alarms had been shunted because of some other door issues. Several people that were on the train were interviewed by local news media and I saw some of that coverage on Global TV news. Two guys said they had to hold on to support poles so that they did not fall out of the open door. I'm relieved to see that TransLink is now considering this incident to be serious as over the weekend the TransLink spin doctors were unusually cavelier when interviewed about this very serious safety incident. Let's stop trying to explain things away guys and admit that this is UNACCEPTABLE for a transit system in a soon to be Olympic city. It is not acceptable even in the Third World. I try to be understanding with TransLink, but I was angered by their lack of concern over the weekend. If there was an issue with doors that required an operator to drive the train, then TransLink staff should have manned every car until the train was taken out of service. The spin ends here gentlemen. What a Christmas season it has been for public transit and the pedestrian in Metro Vancouver. I had the pleasure of taking Translink every day since the 22nd, and let me tell you, it has been an adventure. First let’s start with walking. I commented on an earlier post about the lack of snow clearing on sidewalks in the region. Talking to people around Downtown Langley, many elderly commented that they felt trapped and like second rate citizens. One senior at a bus stop commented that “back in the day” the bus stops used to be cleared with a path to the road. She said that things are worse today. Another senior in my building said that things in Langley aren’t very “senior friendly” when talking about the snow. The Langleys, Surrey, New Westminster, Coquitlam, Vancouver, Burnaby, and Pitt Meadows (these are the places I walked this past week) are not pedestrian friendly in the snow period. While the major roads were cleared, the sidewalks were impassable. I saw a person in a wheelchair on the side of the road almost get run over because the sidewalk wasn’t cleared on Columbia Street in New Westminster. The snow really highlights the lack of priority placed on the pedestrian. Municipalities and the provincial government talk about the need to focus on walking and biking, but at the end of the day it really feels like an afterthought. Otherwise why would utility poles, lamp standards, snow, and sand piles be in the middle of sidewalks? Wouldn't their be more bike lanes? What can be done about this? On the snow removal front, it always snows during the winter in Metro Vancouver. Municipalities should require (pass bylaws) that sidewalks are to be cleared by landowners, stratas, and businesses. This is done all over Canada. Cities in the Okanagan Valley, Calgary, and Edmonton all require this. In Vernon, they used to run ads in the papers, radio, and TV to remind people to clear their sidewalks. When I was talking to a business in Downtown Langley, she didn’t realize that in other parts of Canada local municipalities clear their downtown and high pedestrian areas. She seemed shocked that other snowy parts of Canada have cleared sidewalks. An impassable sidewalk can’t be good for business. On the general pedestrian accessibility front, move utility poles and lamps to the sides of the sidewalk as roads are being built or rebuilt. Also, require that sidewalks be passable and free of debris all year. Paint bike lanes on the road, many roads are wide enough for this. Surrey has been retrofitting some roads with bike lanes for a while, and the Township of Langley’s newer neighbourhoods are bike lane ready. There has been much talk about SkyTrain and Translink in the media this past week. Trains driving with open doors, failure of track switching and the automation system; the list goes on. It really builds the case for an at-grade, non-automated system. Anyway, the people at Coast Mountain Bus and SkyTrain really did an amazing job keeping the system going. I over heard many SkyTrain Attendants talking about working 6 hours with no breaks driving trains. Also, bus drivers were packing on people to make sure that everyone could get a ride, sometimes bending the rules. These people deserve a big thanks, but there seems to be some issues with the way that Translink deals with major events. As an example, when the SkyTrain broke between Sapperton and Columbia on Saturday, Translink told everyone to take the 112 bus instead. This bus only ran every 30min. When I lived in Calgary, they had emergency shuttle bus stops that were marked year round for when the light rail system had issues. When there was an issue, there was frequent shuttle bus service. This should be happening in Metro Vancouver today. During the civic election campaign some handbills were circulated by opponents to what is being called the Mufford Crescent Overpass. Mayoral candidate (now mayor) Rick Green stated during that campaign that if elected, he would oppose such an overpass and let the federal government know that we won't be taking their money from them nor other partners. Mayor Green's inaugural address also included statements about this project, and are recorded here and here. The Langley Times recently published this article on the overpass project. April 4, 2005 - Council Report 05-55 "Deltaport Third Berth Environmental Assessment Application"
May 16, 2005 - Council Report 05-98 "Final Submission re Deltaport Third Birth Environmental Assessment Application"
August 28, 2006 - Council Report 06-164 "Proposed Deltaport Third Birth Environmental Assessment Application Report"
March 27, 2006 - Council Report 06-55 "Rail Issues in Langley"
February 5, 2007 - Council Report 07-15 "Master Transporation Plan"
All of these reports are available publicly and there has been considerable public information and consultation sessions. After hiring MCELHANNEY CONSULTING SERVICES INC. to provide conceptual designs and analysis for the extension of 64th Avenue from 204th Street to 216th Street, it was determined that after reviewing the three possible options, only two were viable. Reviewing all of the viable options for this alignment, a focus was placed on the current choice that unfortunately is very difficult for us to reproduce a graphic for on this blog. Consideration had to be given to other roadways in the TOL that would be impacted by current and future traffic patterns. This analysis included a look at the Langley Memorial Hospital access roads, 200th Street, the Bypass/Hwy. 10, and thirty-seven (37) rail crossings without grade separation in Langley! Of course there were many more considerations that the engineers examined. Mayor Green acknowledged at the end of this staff to council presentation that there was considerable public interest and opinion on this plan during his campaign. Unlike the campaign rhetoric offered back then, Mayor Green now says that it is not a question of giving back any monies to TransLink and the Federal Government, more than it is about finding the right alignment. It is also interesting to note that a friend of mine was present to monitor this meeting. Her and her colleague work for TransLink. I'm certain they were present at this council meeting because of regional concerns and the support for this project. I know that Mayor Peter Fassbender in the City of Langley is highly supportive of this program, as well as many members of his council members. I was happy to see Mayor Green listening to the staff presentation. He appeared to be keeping an open mind on this project. There will be a public information meeting in the New Year and in fact, Mayor Green made some suggestions to Colin Wright and Doug Hyde as to what slides and maps might be worthy of including for this public meeting. South Fraser OnTrax offers this opinion on this overpass project. We look forward to participating in the public consultation process on this vital project and we will also continue to listen to the experts and keep an open mind. Merry Christmas and a very Happy New Year to all of you. We will write here over the holidays in between mouth fulls of turkey and other goodies. Not sure if we will be able to post every day, but we sure will give it a try. Happy Holidays! Here is a quick follow-up to my post yesterday on winter weather and transit. I found a post on a blog call “Light rail and I: a love story 28 years in the making”. It is written by a light rail operator in Portland, OR. Anyway, she had some interesting insights on winter weather on the MAX (light rail system). Apparent even with 1.2 feet of snow, the system was running. Snow and ice make it necessary to run the trains all night to prevent the overhead wire from freezing over. With 750 volts running through the catanary wire, you would think it could not freeze. It can, and it does in some places. The train momentarily looses power when the pantrograph slides past a section covered by ice. It is an annoying feeling, and at first I did not understand what it was. A couple of times I had to stop and restart the train, other times I just kept on going. While riding transit and walking around both Vancouver and Downtown Langley the last few days, I have had the following observations. 1.) Businesses, Stratas, and Joe Landowner really need to clear their sidewalks. Where I grew up (Vernon), if you didn’t clear your sidewalk the city would come and clear it for you. You'd then get a nice bill from the city. Now I realize that it only snows for about two weeks a year in the South Coast, but sidewalk clearing is a major safety issue and needs to happen. I found myself walking on the road last night and today because the sidewalks in some parts of Langley were impassable. My second observation is this: SkyTrain does not work well in the snow. I applaud the efforts of SkyTrain staff that worked all day to remove snow buildup with hockey sticks so the SkyTrain doors would close (and I can only imagine the other behind-the-scenes work that was going on), but it really speak to the lack of robustness in SkyTrain’s design. 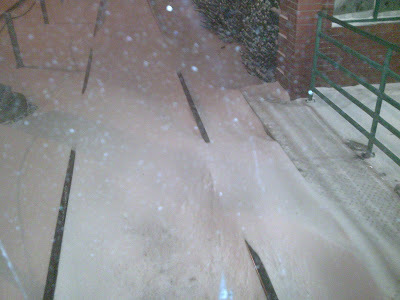 Snow was even blowing through the doors when they were closed. Maybe someone that knows more about SkyTrain can comment on why the system doesn’t handle bad weather. In Calgary when there was bad weather, it seemed the only thing that would run was the light rail system. The doors opened and closed without issue. Signaling and control worked. And while this would not be needed in Vancouver, all the switch gear was heated to prevent freezing. It just seems very strange that the SkyTrain system, which is one of the most expensive types of systems in the world, can’t handle 10cm of snow. Light rail and streetcar work in all weather. The members of South Fraser OnTrax is taking an extended "pause" as we enter this Christmas and New Year season. There will still be posts and information found here frequently. But we must take time out of our busy schedules to recognize Township of Langley Councillor Charlie Fox. Councillor Fox is a VERY strong supporter of light rail transit in the south Fraser and is very vocal about his LRT views in council. We very much appreciate his advocacy and support. Cllr. Charlie Fox is one heck of a guy and I greatly enjoy his wisdom, spirit, determination and friendship. But during this holiday season Charlie, his wife Diane and their family will need your prayers, encouragement and thoughts. This past week Councillor Charlie Fox received word that his kidney transplant will take place on January 7, 2009. Charlie's wonderful wife Diane is the donor and as Charlie jokes, "We are a match in more ways than one." While this transplant schedule is great news for the councillor's overall health, we must keep them in our thoughts and prayers that the transplant goes very well and there are no complications. We wish Charlie and Diane a speedy recovery and we look forward to reporting some great news shortly after January 7th. Thank you Councillor Fox for enriching our lives as residents of the Township. Let us all remember the meaning of this season. …before someone gets hurt: The platform at King George SkyTrain is so packed that people going up the escalator are being pushed into people at the top. Someone had to press the emergency stop button, so no one would get hurt. I was one of the lucky people being squashed this morning. Not a very fun feeling, let me tell you. 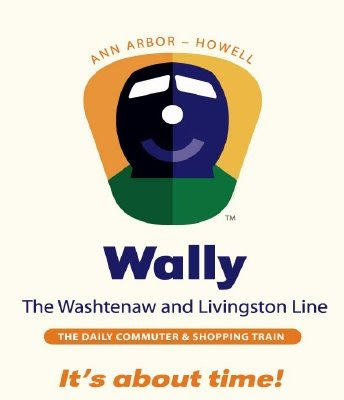 In Michigan state, all levels of government and the private sector are coming together to upgrade a 44km section of single track rail to serve as a commuter line between Ann Arbor, Michigan (POP: 341,000) and Howell, Michigan (POP: 9,232). These communities are near Detroit. This project was proposed by the government because they had the choice of spending $500 million to add an additional lane of highway between these communities, or spending $33 million to get a simple commuter rail system up and running. They will be upgrading the signaling, crossings, tracks, and adding some passing sidings. Capital funding for the rail upgrade are in process. The short line operator, Great Lakes Central Railroad, will be providing the train-sets and operating the line. It is expected that passenger revenue and a government subsidy will cover the operating cost. They plan on running eight trains a day to start. I wanted to point this project out for three reasons. First, it shows that you don’t need to spend lots of money to get a simple rail system going. Second, there are some parallels to our Interurban line. (short line operator, underutilized line, etc.) Third, you don’t need a large population to get a rail system up and running. I invite you to read the business plan for this project. A friend of mine pointed me to a PBS series called e squared. I highly suggest that you watch the episode called “London: The Price of Traffic”. The episode talks about the London congestion charge and how it allowed for the removal of vehicle lanes for widened sidewalks, bike lanes, and bus lanes. It also talks about how the revenue from the charge is used only for public transport. In London, they are actual seeing a modal shift to transit. This is NOT happening in metro Vancouver. What was also interesting was how London is trying to charge their roads to shared spaces to “tame the auto.” They used the example of how removing dividers from one of their streets reduced congestion and traffic fatalities. Also, they have seen a reduction in emissions that are harmful to our health. Anyway, I hope you get the chance to check out the show. If you haven't already heard, TransLink has listed 28 potential ways to get them out of their financial troubles in 2009. Some or all of the 28 will be adopted. The Province newspaper covered that here yesterday. One of the most controversial is a "cellphone tax". People are asking what connection cellphones have with transit and most people I talked with over the past couple of days thinks we already pay far too much for cellphones and a new tax is ridiculous! BC Transportation Minister Kevin Falcon has been busy making re-announcements of plans already announced. The Province newspaper also covered that on December 11th. South Fraser OnTrax is not happy that this extension does not include Langley and we hope that campaign promises in the civic elections will change that. This article from yesterday's Province newspaper speaks about the Surrey and Vancouver studies that ignore the rest of the south Fraser. Again, people expect transit to appear out of thin air without any studies. Just spend billions of taxpayer dollars on transit and don't study or engineer anything. While I'm all for transit and as motivated as anyone to get light rail in operation now, I don't get this lack of logic with regards to studies and engineering. Do these people comprehend passenger safety and the requirements that go with it? I've heard people say that they should just throw a train down on the old interurban tracks and run an experimental passenger train. But if they took the time to read what qualified engineers said in the Township of Langley commissioned UMA Report, they would soon see that there are many old industrial shipping spurs on that line that by Federal Law must be decommissioned by removing them. There are many other examples, but the bottom line is that this is PASSENGER rail and we must put safety first. Finally there is much talk in the USA about what President Elect Obama is going to spend that nation's infrastructure dollars on. This news blog out of Chicago speaks about light rail possibilities and greener cars. I sure wish our own Canadian Federal Government was talking more about passenger rail and light rail transit. On the subject of cars I"m getting a big kick out of all this talk about bailing out the big automobile makers. These guys have been arrogant and failing to deliver what North American consumers want for years now and we contemplate bailing them out? They were asked to reduce worker wages to Toyota and Honda pay levels and they refused. What about a cap on executive compensation? I'm not eager to give these big auto manufacturers one cent of my tax dollars. In 2005 I ordered a loaded Chrysler 300 from a Burnaby dealer. The car was being manufactured in Brampton, ON and I did not get the car within the window of delivery the salesman promised. I was told Chrysler Canada was ignoring Canadian buyers and had my car in a large parking lot in Ontario as Chrysler Canada shipped cars to the USA because the exchange at the time made them more money. The local dealership manager called me arrogantly on the phone to tell me that he wasn't happy that I was calling his salesman for the car and that if I wanted to, they would sell it to someone else. I faxed the CEO of Chrysler Canada and said that one day the economy was going to change and they would only wish for customers like me. His office was arrogant to, but they put my car on a train to fast-track it to BC. I vowed never to buy from these North American manufacturers again. Arrogance, overspending, and lack of customer service is what killed them. Let them die off and replace them with the tram manufacturers and car companies that will produce VERY green cars at very affordable prices. In today's Province Newspapers Brian Lewis talks about a recent chat that new TransLink chief executive officer Thomas Prendergast had with the Surrey Board of Trade at their invitation. As Brian points out, Prendergast came to us from the USA where he served over 30 years in posts that included senior vice-president of New York's subway system and president of the Long Island Rail Road, the largest commuter railroad in the US. "Yes, the man knows his rails and, as he said yesterday, he's not about to dismiss either light rail or the existing Interurban right-of-way options as TransLink plans its options for south of the Fraser. Nor is he convinced that SkyTrain's extension in Surrey has to be a continuation of the elevated system. In fact, when TransLink announces today that it's embarking on two new major studies -- one covering a westward, rapid-transit extension to the University of B.C. and the other focusing on Surrey -- the latter study will look at all options, Prendergast told me yesterday." The project is moving forward after a July report issued by the Federal Transit Administration indicated that the project would pose no significant impacts to the environment. The loop will add 3.3 miles, at a cost of $77 million, to the streetcar line, extending it east across the Broadway Bridge and south to the Oregon Museum of Science and Industry. At the same time, they are building a streetcar system that has been in a state of constant expansion since 2001. 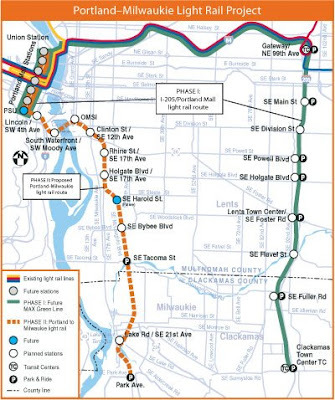 Well, to top that TriMet has recently finished a document called a "Supplemental Draft Environmental Impact Statement (SDEIS)" this November for their federally funded Portland-Milwaukie Light Rail Project which is slated to open in 2015. One of the interesting components of this project is a multi-use transit bridge that will cross the Willamette River. The bridge will carry light rail, buses, pedestrians, and cyclists. The private automobile will not be allowed on the bridge. This is some very progressive thinking, and it’s a great example of governments working together. The whole project will cost approximately $1.4 billion. The US federal government's share is expected to range from $710 to $850 million, $250 million is coming from the Oregon State Lottery Bonds, and the rest should be coming from local governments. Anyway, I suggest that you check out their website on this project. December has shaped up to be a very busy month for me. With 2009 looking to be a not-so-hot year in media (layoffs at Rogers, CTV, Canwest), we are busy cramming as much projects into 2008 so 2009 will look nice to all the shareholders. Anyway, all this is to say that my blog postings will be a bit light for the remainder of this year. I had a bit of an epiphany while taking the bus this morning about street lamp Christmas lights. It's a pretty good indication that you're in a walkable neighbourhood/town centre if you have Christmas lights on your street lamps. One sure sign that Whalley is transforming into a walkabout town centre is the appearance of pretty lights on the street during the holidays. Who needs fancy density charts and zoning maps when all you need to do is look for the lights? While new people help drive Surrey's economy via needs for housing, shops, jobs, etc., they also need many services. Thus, public transportation is a top priority, she says, and it will include developing plans for expanded bus services, light rail, rapid bus systems, as well as utilization of the old Inter-Urban rail line in some fashion. Watts will push hard for Victoria to drop plans to extend Surrey's elevated SkyTrain line and select a ground-level extension instead. She's disappointed that Victoria's recently announced Valley transit study does not include Surrey. "Planning collectively gives you a better result," Watts says. Wow, if ever a politician gets it! Mayor Watts is right on top of this file and she understands Light Rail Transit for sure. Very early this year she announced that she had received some information from the BC MoT regarding a comparison of SkyTrain vs. Light Rail. So it appears that the good mayor has done her homework and has made up her mind. For the past several months she has been making very pro-LRT statements. Good on her! There could be other strong supporters, but these are the people that I am familiar with and heard their voices in council. There are a few new politicians that made some campaign promises and so the jury is out on them. Maybe we can update this list as time goes on and add these new people in time. Way back in April of this year, I wrote a post about SkyTrain security. For some background, the provincial government is proposing to spend $125+ million to add security gates at all stations. I thought they could skip the gate system plus gate attendants, and just add security guards at the stations to save money while providing enhanced security. TransLink has introduced dedicated station attendants at the four SkyTrain stations (Surrey Central, New Westminster, Broadway and Main) where people have the most security concerns, as well as increasing staff presence at Metrotown in the evenings whenever possible. 61% of TransLink Listens panelists support dedicated staff at stations. I received the following news second hand. I was told that Surrey Mayor Dianne Watts during her inaugural council meeting speech said that by the next municipal election, in 2011, she will have the Interurban restored in Surrey. This is truly exciting news. From Surrey to Abbotsford, and now even Chilliwack, there is a real desire from our local leaders to see light rail in the South Fraser and Fraser Valley. I hope the Province and Translink are paying close attention. The time is right for light rail. I'm behind in my writing projects. When security consulting work rains, it pours. As this is a labour of love for Nathan and I, sometimes life overrules this blog. We try not to though! The information at this breakfast was exceptional as always. As transit advocates, we welcome this kind of forum and the information presented. It's a shame that more members of the general public don't attend these events, as they are attended mostly by people working in the field of planning, development and government. When people attend these events on a regular basis, they begin to understand much more about efficient/highest land use and the need for walkable neighbourhoods that support good public transportation networks. I encourage you to view and digest these cutting-edge community planning slide shows. Ronda Howard must help the mature City of Vancouver find density opportunities. Vancouver is doing this by allowing home owners with garages in laneways to develop those garages as apartments and offices. Ronda calls this "Hidden Density". From a crime prevention standpoint I love this idea, as it brings more eyes and ears to a part of the street that often goes neglected and unobserved. The more natural surveillance and "legitimate users" we bring into an area, the safer our communities become. Ronda communicated that there is also some "Gentle Density" available by seeking out "Neighbourhood Centres" which many of us in Langley call the "Urban Village concept". These are basically complete and walkable communities that provide housing diversity, shopping and other needs into a compact community village. Lastly, Ronda spoke about "Invisible Density", which are secondary suites. Many areas of Vancouver will soon allow for a secondary suite plus a lanehouse, creating quite a mortgage helper for the homeowner, but perhaps more importantly, affordable housing options for more people. With many single-family homes in Vancouver costing more than $1M, options are needed for the masses. This is VERY smart growth that Ronda Howard and her team are planning.